This article is about King K. Rool's ship from the Donkey Kong franchise. For the final level in Donkey Kong Country, see Gang-Plank Galleon. For the world in Donkey Kong Country 2: Diddy's Kong Quest and Donkey Kong Land 2, see Gangplank Galleon (world). Not to be confused with Gangplank Galley. Gangplank Galleon (also spelled Gang-Plank Galleon) is the name of King K. Rool's ship, which the Kongs had to board on numerous occasions and fight the enemy forces present there. The original Donkey Kong Country is the only game where the ship is seen in use, while later games depict it as stationary or dilapidated. Given its sails and rigging, the Gangplank Galleon is mostly based on classic depictions of pirate vessels, although it went under slight design transformations with each game. In Donkey Kong Country, the Gang-Plank Galleon is visible on the overworld map, where it draws closer to the island with each area that is completed. It hosts the final boss battle in the game, accessed after completing the Chimp Caverns. Going onboard, Donkey Kong and Diddy Kong encounter and fight King K. Rool, who is eventually defeated and Donkey Kong's coveted banana hoard is returned. 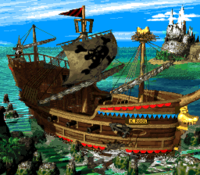 In the SNES version, the Gang-Plank Galleon, as it is shown on the map, contains a single mast, although the Game Boy Advance version of the game depicts the ship more realistically with two additional masts. A black flag rises at the top of the main mast, just above a crow's nest. Kremling-specific elements of the ship include the Kremling Krew's emblem on the mast (a Kremling Jolly Roger) and the figurehead on the prow. It also hosts five cannons on one side. In Donkey Kong Country's Game Boy counterpart, Donkey Kong Land, the galleon is part of an area called Gangplank Galleon Ahoy! It is docked on the coast of Donkey Kong Island. Donkey Kong and Diddy Kong must travel on the ship itself, but also on the surrounding grounds. Instead of King K. Rool, a large ray named Wild Sting is the boss of the Gangplank Galleon. Compared to its appearance in Donkey Kong Country, Gangplank Galleon presents several notable changes. It now features a frontal and rear mast, and the main mast now lacks the Kremling Krew's emblem. Instead, several sail spars are joined to all of the masts. The crow's nest has been moved on the back mast, and the upper deck has been lowered to be level with the main deck. Later, in Donkey Kong Country 2: Diddy's Kong Quest and Donkey Kong Land 2, the Gangplank Galleon is the first world Diddy and Dixie Kong traverse before they venture into the mainland Crocodile Isle in order to rescue Donkey Kong, prisoned by Kaptain K. Rool. The vessel has become beached on the rocky shore of the island and appears to be in medium disrepair. Diddy and Dixie have to venture through the ship's remains to reach the area's guardian, Krow, who resides in the ship's crow's nest. After defeating the giant bird, the Kongs advance to the nearby Crocodile Cauldron. Two sunken pirate ships similar to the Gangplank Galleon appears in Crocodile Cauldron and Krem Quay. At the end of Donkey Kong Country 2, the Gangplank Galleon sinks to the bottom of the ocean, along with the rest of Crocodile Isle. The ship has yet again been corrected to bear the designs from both Donkey Kong Country and Donkey Kong Land. The sail with the Kremling Krew's emblem is seen covering the main mast again, accompanied by two other masts. There is a golden figurehead of K. Rool under the bowsprit. A red flag is flown at the top of the main mast, replacing the black flag from the original game; the number of cannons from the wall has been reduced from five to three. What are presumably the remains of the Gangplank Galleon appear in the Donkey Kong 64 stage, Gloomy Galleon. Though the Gangplank Galleon was never named as such, it did appear on the Donkey Kong Country television series. Here, the ship was owned by the dreaded pirate Kaptain Skurvy instead of King K. Rool. On the show the ship often met with disaster, such as being eaten by Jr. Klap Trap in the episode "Booty and the Beast" and accidentally being blown up by Klump in the Christmas-based episode "The Kongo Bongo Festival of Lights". The Gangplank Galleon, though only referred to as "King K. Rool's ship", also appeared in the Club Nintendo comic "Donkey Kong Country". Like in the game of the same name, it served as the location for the fight between the Kongs and K. Rool. Besides the latter, several other Kremlings can be seen on the ship. An arrangement of Gang-Plank Galleon is part of the soundtrack in Super Smash Bros. Brawl. It can be heard at Rumble Falls and one of the stages of the Subspace Emissary. The arrangement reappears in Super Smash Bros. for Wii U on the Kongo Jungle stage. For Super Smash Bros. Ultimate, a new arrangement by ACE accompanies the reveal trailer for King K. Rool as a new playable fighter. The Gangplank Galleon's theme, "Gang-Plank Galleon," appears to be loosely based on the title theme for the 1991 NES port of Sid Meier's Pirates!, also developed by Rare. Krematoa Appears - The tune that plays when Krematoa surfaces in Donkey Kong Country 3: Dixie Kong's Double Trouble! In Donkey Kong Country, it is never explained how the ship sails away from DK Island just before the battle with King K. Rool. In Donkey Kong 64, although the bow and midsegment of the sunken ship are seen, the stern is nowhere to be seen. In the original version of Donkey Kong Country 2: Diddy's Kong Quest, the ship is docked on the left side of the island, but in the GBA version and Donkey Kong Land 2, it is docked on the right. * Exclusive to the Game Boy Color version. ** Exclusive to the Game Boy Advance version. *** Exclusive to both remakes. This page was last edited on April 13, 2019, at 21:16.